Selma has been so kind to again make a card for this weeks Card Challenge. Thank you Selma! And, what a beautiful card she created to show you. You can read all about it at here! 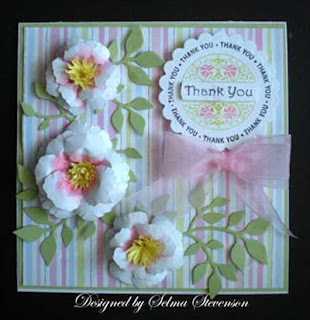 Create a thank you card. You will have until next Thursday (March 23) morning 6:00 AM EST to link your card/project. A winner for the prize will be chosen from a Random drawing and will be announced Friday morning (March 24). You can enter more than once. Be sure to stop over at Selma's to see her beautiful card and read the details. A winner will be chosen from the Random Drawing for week #10 challenge will receive a Sarah Kay Stamp. And will also be entered in the end of the year $100 gift certificate drawing. Or if you are posting to the SCS gallery, you will need to use a special code to tag your card to the challenge. This week's code is JG0317 and needs to be posted with the challenge. The shop is all ready and it looks so nice, the projects are almost ready and things are coming right along for Saturday. Hi, I have just entered my card for the challenge, I hope it meets all the requirements. Great Challenge and thanks for the chance to win a new stamp. Thanks for another wonderful challenge, Joan! Selma's card is gorgeous! Hope you're having a great weekend! I seem to be a little behind this week, but I did finally get my tag and my card entered! Glad your workshop was a huge success! Doesn't Selma work magic with her flowers! Thanks for another great challenges. Sounds like the weekend was a success. Love Selma's Card.